What’s the deal with Brexit? Will there even be an exit deal between the United Kingdom and the European Union by March 29, 2019? That’s the deadline, and it’s getting dangerously close with no deal in sight as of yet. If you and your pet will be visiting or relocating to the UK soon, we know you’re on pins and needles. How will the Brexit situation affect your travel? And what about your pet? Precarious as this may feel, you’re in luck because you are headed into the UK. The rules for importing pets have not changed and will not change after March 29, no matter where you’re coming from, Brexit or no Brexit. The pet owners who should be concerned are British citizens/residents who want to travel or move with their pet to an EU country. Those rules could change dramatically, depending on if there is a Brexit deal and, if so, how the UK is classified. We’ll have to wait and see on that. For now, the British government recommends you allow at least four months to plan pet travel from the UK to anywhere in the EU. They also recommend that you chat with your veterinarian about this, as British vets have the latest information, such as it is. 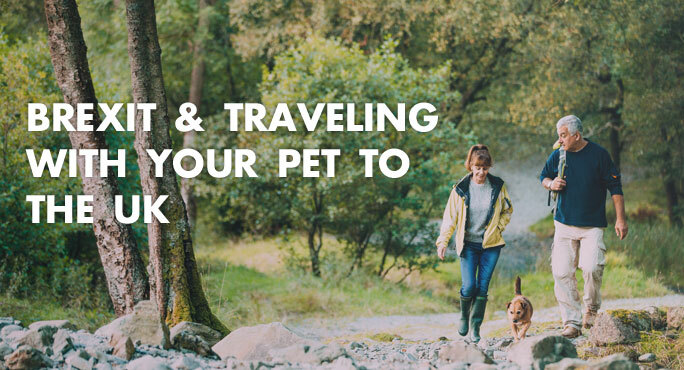 So what will it take to bring your pet into the UK? We’ll assume your furry friend is a cat, dog, or ferret, as those are the most common pets entering Britain. We’ll call him Charlie. Let’s also assume you’re coming from the United States, since the rules vary somewhat depending on your country of origin. Pets and their owners must arrive in Britain within 5 days of each other. So, your Charlie could arrive 5 days before or 5 days after you do. Anything more than that, and the rules change a bit because Charlie becomes a commercial shipment. You have to book an approved carrier (airline, since Charlie is coming from the US). A microchip. Microchipping must be done before Charlie receives his rabies vaccination, as his ID number and the microchip date have to appear on his rabies certificate. The UK prefers microchips that meet ISO 11784 and ISO 11785 standards. Rabies vaccination, if Charlie is at least 12 weeks old. The UK accepts either 1-year or 3-year vaccines, as long as it is an inactivated or recombinant type vaccine approved for use in the US. However, if the first vaccination takes place right after microchipping, it will only be considered valid within the first year. So, if Charlie received a 3-year rabies vaccine just after microchipping 18 months ago, he will need a fresh booster, even though technically his current vaccination is still in force. Coming from the US, Charlie will not have to undergo a rabies titer test, which might otherwise delay his travel plans. That said, he cannot enter the UK within 21 days of receiving his rabies vaccination. If Charlie is a dog, he must also be treated for tapeworm, at least 24 hours but not more than 5 days prior to his date of entry into the UK. The treatment must contain praziquantel or another ingredient proven effective against Echinococcus multilocaris. A UK animal health certificate. A USDA health certificate, endorsed by a USDA veterinarian within 10 days of the date of issue. You can make copies of Charlie’s travel documents, but the originals must accompany him. Pets who do not have an appropriate microchip or the required tapeworm treatment can be sent to quarantine instead of being released to you, or the UK has the right to refuse them entry altogether. With all the other complications of an international trip or relocation, why add the uncertainties of Brexit to the mix? The one way you can be confident you’re following the correct rules is to let our Starwood team handle all the intricacies of Charlie’s move on your behalf. The UK is home to us, as is the US, so we are not only in the know but on the ground, ready to assist in every way.